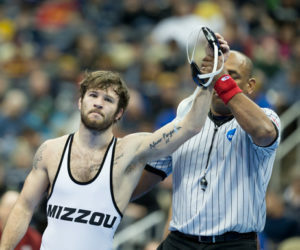 Mizzou Wrestling wrapped up its bouts at the 2019 NCAA Division I Championships Saturday afternoon (March 23) and saw four of its nine qualifiers place in the top six of their respective weight classes. RS junior Jaydin Eierman earned third at 141 and RS senior Daniel Lewis took fourth at 174. Additionally, RS senior John Erneste (133) and true freshman Brock Mauller (149) earned sixth-place nods. All four are All-Americans, giving Mizzou at least four All-Americans in three straight seasons. Mizzou currently sits sixth in the team standings with the championships taking place tonight.